I officially ran out of my Fashion Forms Garment and Body Adhesives tape and I’m really sad about it. I bought this tape back in 2007/8ish when I worked at Bloomingdales, What is that… SEVEN years (?!) of companionship? Seven years of gap-free blouses? That’s golden. If you know me, you know I’m a bit OCD and territorial about my things; aren’t we all though – a little? You spend your hard-earned money on something and then you lose it or you run out of it and you just can’t shake the feelings? Anyhow, when I’ve had something for so many years it just makes me sad that it’s over. 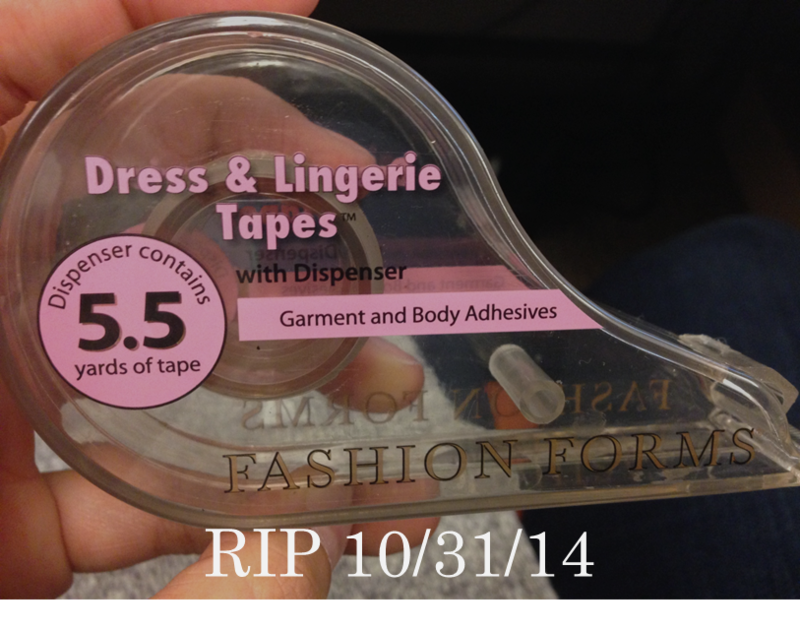 Fashion tape, you will be missed my friend. Before I run off to mourn for like another hour, I’m sure you’re just dying to know what I’m going to be for Halloween, since I haven’t really dressed up since 2010, aren’t you!? Well, you’ll just have to wait to find out! Make sure you’re following me on the ‘gram – I’ll post a pic later.